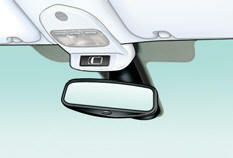 Each fitted with an adjustable mirror glass permitting the lateral rearward vision necessary for overtaking or parking. They can also be folded for parking in confined spaces. If your vehicle is fitted with heated mirrors, the demisting-defrosting operates by switching on the heated rear screen (refer to the "Rear screen demist-defrost" page). 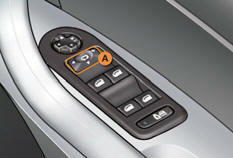 From inside: with the ignition on, pull the control A in the central position rearwards. 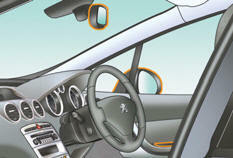 The folding and unfolding of the door mirrors using the remote control can be deactivated by a PEUGEOT dealer or a qualified workshop. 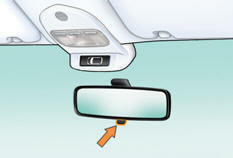 Never fold or unfold the electric folding mirrors manually. System which provides a view of the ground during parking manoeuvres in reverse gear. With the engine running, engage reverse gear. 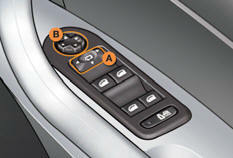 Select and adjust the left-hand and right-hand mirrors in succession. The adjustment is stored immediately. The glass of the mirror selected tilts downwards, in accordance with its programming. Exit reverse gear and wait ten seconds. The mirror glass returns to its initial position. - if the engine is switched off. Pull the lever to change to the "night"